For the first time ever on full cd: - elvis at the piano - out now !!! 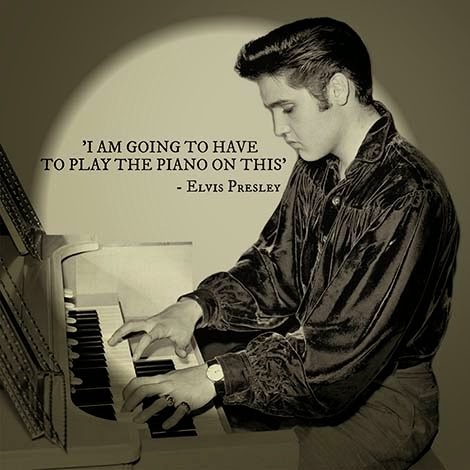 From his earliest recordings, Elvis would sit at the studio piano and get in the mood for a session by singing some of the old and great songs. Sometimes he would go to the piano between takes or between songs, perhaps to center himself by returning to his roots. Fans have always greatly enjoyed the survived recordings of Elvis at the piano, although strangely enough a full album of these recordings was never released. Housed in a stunning jewelcase with 8 page full color booklet with great ‘Elvis at the piano’ pics and liner notes, this is a release you simply can’t ignore. It has a very limited edition of only 300 copies.